For two years running, Southern Exposure’s Annual Monster Drawing Rally has thrived at the Verdi Club. The staff is incredible and the space is simply magical. Whatever you do in this city, make sure you do it at the Verdi Club. The Verdi Club is the dream venue for our annual parties. Its classic and authentic style, the friendly and easygoing manager and staff, and the access to great kitchen facilities make it impossible for us to consider going anywhere else in San Francisco for our annual event. ReadyMade hearts Verdi and Denny! Celebrate your event with us in a great place, in a great location, with classy folks who enjoy the best that life has to offer. 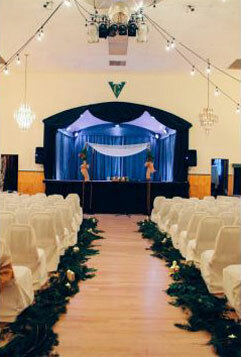 Whether you want to rock out or glam up, the Verdi Club is a versatile space for a variety of events.